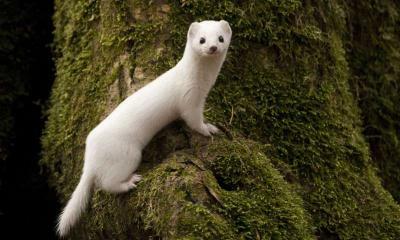 PARIS, May 25, 2018 (BSS/AFP) - Fluffy white weasels that once frolicked in snowy fields unnoticed now have a target on their back thanks to global warming, scientists said Thursday. It's a question is "camouflage mismatch". The population of white-coated Mustela nivalis nivalis in Poland's Bialowieza Forest, they found, has declined sharply as climate change reduced the number of snow-covered days by half in 50 years. Compared to the 1960s, snows in the forest's high-altitude regions disappear each year nearly a month earlier, and well before the nimble mammal's fur molts into earth-coloured tones. This exposes the weasel to foxes, wolves, raptors and other predators, the researchers reported in the journal Scientific Reports. "Climate change will strongly influence the mortality of the M. n. nivalis weasel due to prolonged camouflage mismatch," Kamal Atmey from the University of Bordeaux and two colleagues in Poland concluded. Wearing a winter coat after the Spring thaw "may lead to local extinction." The common weasel is native to Canada and Eurasia, and has been introduced in many other regions of the world, accidentally or for pest control. The slight, furtive animals live on a diet of small rodents, especially mice, and sometime larger prey, such as young rabbits. Only the M. n. nivalis subspecies in snowy regions has evolved the capacity to don a luxuriant white coat for the winter, losing it gradually as cold weather gives way. But this evolutionary process took thousands -- perhaps hundreds of thousands -- of years, and cannot be reversed in a few decades, the researchers said. That could be bad news for the weasel. "If M. n. nivalis is not capable of responding to climate change by shifting its moulting time, it will either disappear locally or shift its range," they wrote. A brown-hued cousin weasel, Mustela nivalis vulgaris, would likely fill its niche. To verify their hunch that the white-as-snow subspecies was getting picked off by raptors and foxes more easily in early Spring, the scientists placed mock weasels in different settings. The results were unmistakable, they said: "Camouflage was the most significant factor affecting detection by a predator." Many animals are having trouble adapting to climate-driven changes in their environment. Polar bears risk starving because the floating ice they use as mobile hunting platforms have melted, forcing them to swim past their comfort zone in search of seals. Extreme heat in the tropics has forced some hummingbirds to seek shade instead of foraging for food, cutting down the time they have to seek nourishment. The freezing rain that often falls now instead of snow in northern Finland makes it harder for reindeer when the lichen and moss they eat becomes trapped under a layer of frozen rain.